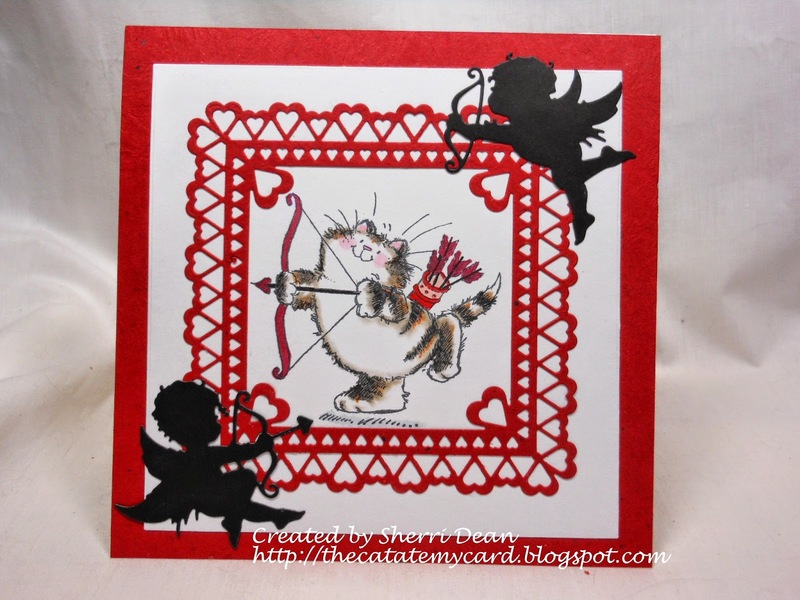 Dies R Us: Cupid's Coming! Are you going out to celebrate tonight or are you staying home to watch the new year come in while you watch tv & snack? When you live in the colder climates where you have to fight the ice, snow & bitter cold, staying home sure sounds like a lot nicer choice! I hope you all had a fantastic Christmas! And now that Christmas is behind us, I know you are thinking ahead to the next holiday & the cards you will need for Valentine's Day. Today I'm sharing a card I made with one of my favorite Penny Black stamps. Being a "cat" person, I love all the cats they have & this one is no exception. I've used it many times, but I think this is the cutest version I've done yet because of the fantastic dies available! I used only two dies on this card: Impression Obsession Cupids and Cheery Lynn Sweetheart Frame. I hope you will all head to the Dies R Us store to check out all the fantastic dies available for Valentine's Day! The selection will just amaze you! Trust me, I've been adding a lot of them & will share them over the next few weeks. Be sure you check out the Dies R Us Challenge Blog too. A new challenge starts tomorrow & runs until the 15th with chances to win vouchers to the store! Wishing you all the very best for this coming year! Darling Valentine Sherri! Love the dies with your super cute colored kitty!